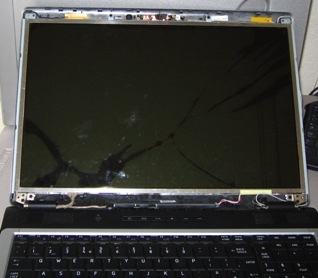 The Equium had been dropped, resulting in major damage to the screen. BCS connected the screen to an external monitor and tested the laptop thoroughly. It was only the screen that seemed damaged. Within a couple of hours we emailed the client some important files that were needed immediately. This was done free of charge. BCS do stock several models of screen, but this was the larger and more modern 17.1" screen. We ordered it in, and it arrived next business day. The screen was fitted and delivery arranged. We offer this service to all business and home users, please contact us if you require repairs. 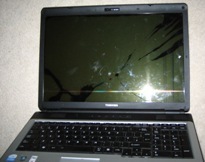 For your information, the price for this type of laptop was £185 plus VAT. 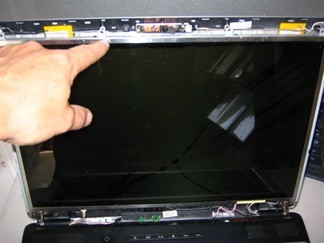 We can also help by supplying you the screen so that you might try the repair yourself. How we did it. "Power off, battery removed" very important! Remove the rubber bits covering the 4 screws holding the plastic bevelled edge surrounding the screen. Put to one side and unscrew the 4 screws. Gently work the plastic surround off, it should unclip without breaking, finger nails or a thin flat head screw driver should be enough. This one was awkward near the bottom by the keyboard. The laptop should look like unit above. 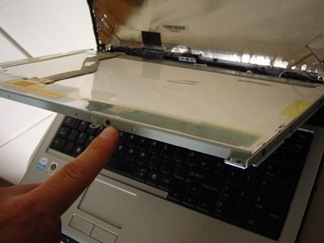 Every laptop is similar, this Toshiba had about 4-6 screws holding the panel in. Undo them, and the panel should come forward, allowing us to unclip the panel connectors. Next we unclip the large connector (running down the back of the screen) and the small connector at the base of the screen. 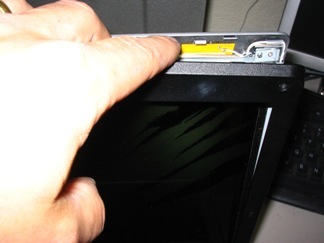 Replace the LCD panel - the old one unscrews from the metal case quite easily. Screw the new one in. The replacement screen's lower connector was TOO SHORT. I cut the cables, soldered a longer connector on, and heat treated the cover I inserted over the joins. 5 minutes. This is the kind of thing that can happen. Test the screen by carefully powering up the unit, if it works, remove the battery again and apply everything in reverse, until the unit is fully back together again. 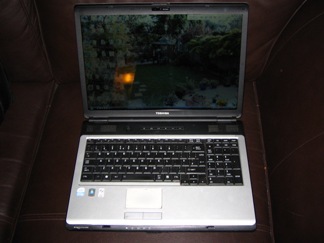 The laptop fully repaired above, before it was delivered to the customer.